When @missmisschelle told me about Raw Spice Bar, I knew it was a company I wanted to get to know. Raw Spice Bar is a company that creates globally-inspired spice and flavor kits made from freshly ground spices. They offer monthly flavor kit subscriptions to customers, and include recipes in the kits and online. It is a nice way for people to get fresh ingredients delivered to their door and to explore dishes from different regions of the world. I received a kit that included Freshly Ground Red Chiles, Cumin & Oregano Rub, and Sumac & Sesame Za’atar. I decided to challenge myself with a steak recipe I found. Below is a recipe adapted from: http://www.epicurious.com/recipes/food/views/rib-eye-steaks-with-oregano-cumin-and-paprika-233396. As usual, I worked with the ingredients and tools I had available, and based the adaptation on my own trial and error. Time: 45 minutes. Serves 2. 1. Mix oregano, cumin, and paprika in small bowl. 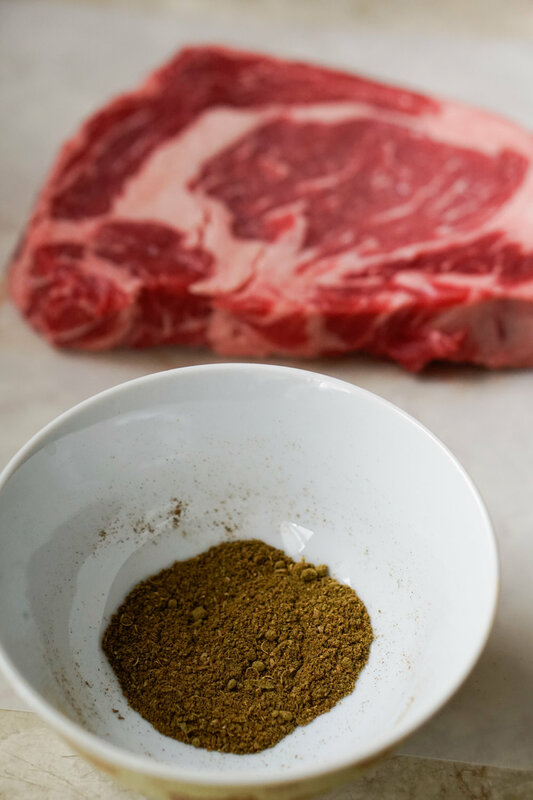 Season the steaks with salt and pepper, then sprinkle each side of each steak with 1 teaspoon of spice mixture and press to adhere seasoning onto the steaks. Place the remaining spice mixture aside. 2. Heat oil in a large non-stick skillet over medium-high heat. Add steaks and cook about 5-7 minutes on each side (for medium-rare). Leave the stove on, but remove the steaks from heat and transfer to a platter. 3. Using the same skillet, combine beef broth, red wine vinegar, honey, and the remaining spice mixture into the skillet. Boil for 3 minutes to reduce the sauce, stirring frequently as it becomes thicker. Add butter and season the sauce with salt and pepper. Pour the sauce over the steaks and serve. My usual steak recipes are simply seasoning with salt and pepper and steak seasoning, and then grilling it. This was my first time making a successful steak in a skillet, and my first time using these seasonings and creating a sauce to go with the steak! The steak went surprisingly well with the oregano, cumin and paprika and the sauce helped keep the steak nice and juicy. While I did not use a recipe provided by Raw Spice Bar this time, I still want to thank Raw Spice Bar for encouraging me to try out recipes outside my comfort zone, based on the spices provided to me. I am looking forward to trying out the other two spice packets!